Nutra-Saff is a seed bred by scientists at STI (Safflower Technologies International) and Montana State University. 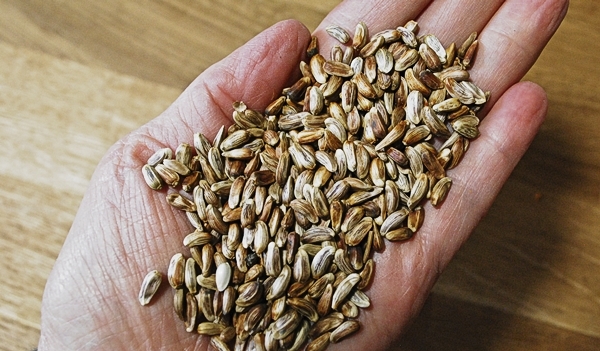 The result is a much thinner hulled seed that is higher in protein, oil and fat and easier for birds to get into and to digest. I must admit that the whole scientist-created thing is a little off-putting to me, (it makes me think of people junk food), but it is supposed to be non-GMO and free of chemicals and more nutritious than regular safflower. The reason I thought about trying this seed again is that most of the birds that visit my bird feeders, as well as the squirrels and ground hogs, have learned over the years to eat safflower. So where I used to be able to switch some of the feeders from sunflower to safflower when the annoying late winter and early spring flocks of Common Grackles, European Starlings, Red-Winged Blackbirds and Brown-Headed Cowbirds came through, that doesn’t work anymore. I was thinking about how they learned to eat safflower over time and wondered if they would have to learn to eat Nutra-Saff. In other words, would these flock birds be at least initially turned off by this version of safflower and leave the feeders alone? And at the same time, would the regular birds be willing to give Nutra-Saff a try as it is basically a different version of the regular safflower that they like and eat year round? This could solve a problem for me. If the flock birds turned up their beaks at it, but the Northern Cardinals liked it, I could put the Nutra-Saff in at least some of the feeders and not have the cardinals always being blocked from the feeders by those more dominant visiting birds. The second thing I was thinking about is how some of the birds don’t seem to go for the safflower at least partially because their beaks are not designed to break open such a hard-shelled seed. Would smaller birds, like American Goldfinches be able to eat the much thinner hulled Nutra-Saff? Would they be willing to try it and if they did, would they like it? 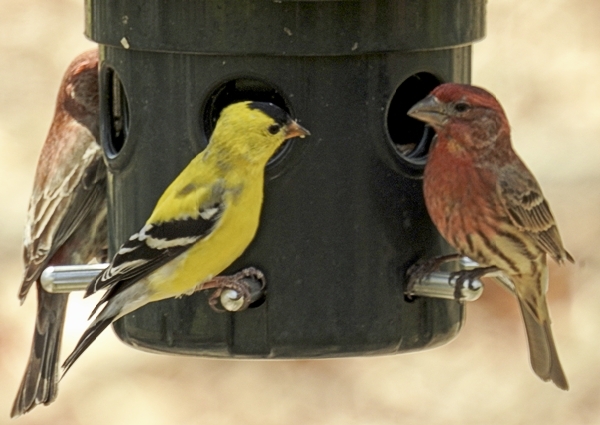 Cost can be a consideration in feeding birds too. At my local bird store, Nutra-Saff is a few dollars more than regular safflower, but still quite a bit less expensive than the same weight of sunflower hearts. If all the same birds like both Nutra-Saff and safflower, then it would probably be a little cheaper to keep using the regular safflower. But if some of the flock birds don’t like it, then I’d be going through less seed, so spending a few dollars more might actually create a net savings. And if I could offer Nutra-Saff in some feeders that currently have sunflower hearts and the birds liked it just as much, then I would probably save money. 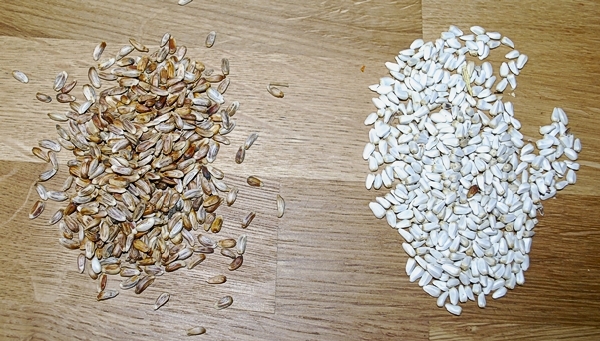 Note: It’s a little tricky to compare the relative cost of seeds with shells/hulls to seeds without because with the first, you are paying for shell or hull that will be discarded, so the higher package price of the second is actually not quite such a big difference as you might first think. Sunflower chips/hearts have no shell or hull at all. Regular safflower has a hard thick white shell. Nutra-Saff eliminates the white shell but there is still a thin brownish (“golden”) hull that the birds don’t eat. I first tried putting the Nutra-Saff in a Squirrel Buster Plus tube feeder in the front yard that I had been filling with sunflower hearts. 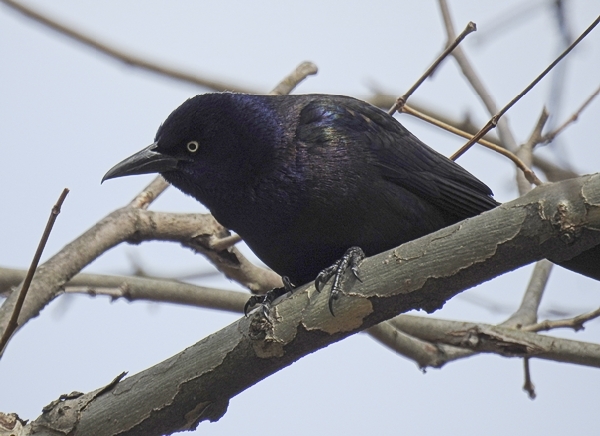 The Common Grackles were dominating it this day, it so I thought it would be a good one to try swapping out first. The results were mixed. The grackles were not happy with this seed and after poking around on the feeder for awhile trying to figure out where the sunflower seed went, they left. They come back every now and then to see if anything has changed but mostly are staying away. So that part was good. At first the House Finches wouldn’t eat it either, but one or two eventually gave it a try and then settled in to eat, but not all of them were convinced and so the feeder was fairly lonely. The Tufted Titmouses and White-Breasted Nuthatches zipped over to the feeder, immediately grabbed a seed and went off to eat them. They must have liked what they got because they all came back several times. I’m fairly sure that a Dark-Eyed Junco ate some of this seed on the ground too. The one American Goldfinch I saw on the feeder peeked into the port, didn’t like what he saw and left. He must have told his buddies because I haven’t seen one on this feeder since. One European Starling came by and ate some of the seed. I think they will eat almost anything they can get their beak through and eat regular safflower in my yard, so that wasn’t surprising. 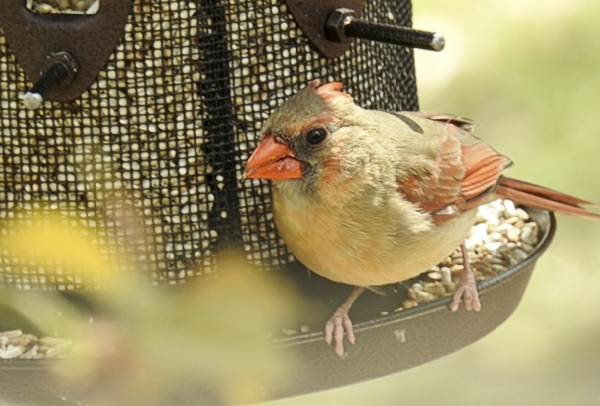 I don’t usually get Northern Cardinals on the Squirrel Buster Plus feeders, but I did put a little in the bottom catch tray area of the big metal mesh feeder in the front yard that they like and saw a male and female cardinal snacking on it right away. 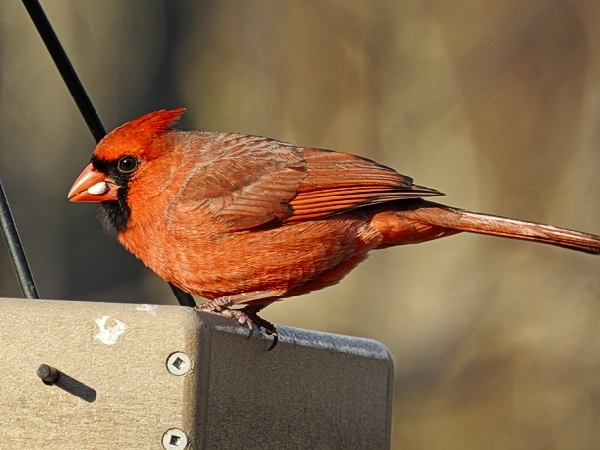 In late afternoon, I tried filling the hanging platform feeder in the middle of the backyard with this seed to see if I could entice some cardinals. I saw several eating it off and on, as well as several Mourning Doves. A Red-Winged Blackbird was willing to eat it as well. Most of the usual safflower eating birds concentrated on the regular safflower in the other pole-mounted platform feeder further back in the yard, but they usually prefer that feeder anyway. In the morning, the Squirrel Buster Feeder in the front yard didn’t seem to be getting any customers but it was a quiet day in the yard (which could mean there was a Cooper’s Hawk lurking somewhere or maybe it was just because the trees are leafing out so there are more bugs to eat.) But a Red-Winged Blackbird and a Northern Cardinal both seemed quite happy to eat the Nutra-Saff at the hanging tray feeder in the back yard. STI claims that birds prefer Nutra-Saff two to one over regular safflower. It’s only been a couple days, but so far in my yard, that hasn’t been the case. 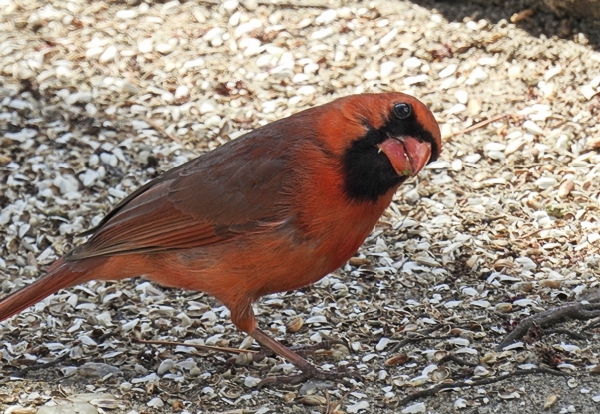 Initial reaction, even with the cardinals, seems to be a preference for the regular safflower or at best, for the ones willing to eat it, about them same. I was seeing cardinals getting on the little hopper feeder to eat the regular safflower instead of getting into the Nutra-Saff filled platform feeder right next to it and it is the other way around with these feeders most of the time. But it can take birds a little time to get used to a new-to-them seed so that may not mean a lot. 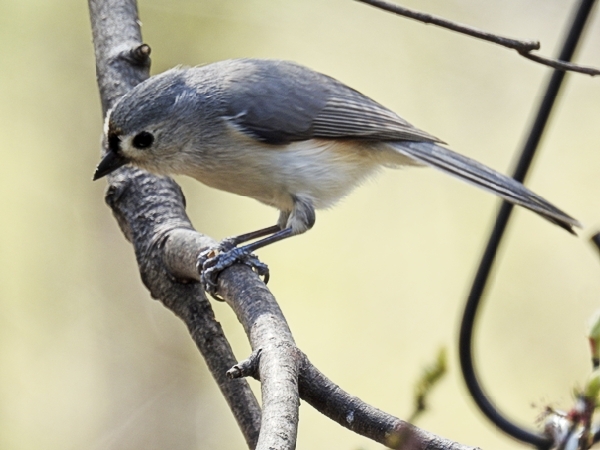 By late in the day, I was seeing the same birds willing to eat the Nutra-Saff: Northern Cardinals, Red-Winged Blackbirds, House Finches, Mourning Doves, Tufted Titmouses, White-Breasted Nuthatches and Carolina Chickadees. Not every bird of these species is eating it at this point. Some individual birds will and some won’t, but I’ve found over the years that usually when one bird in the group figures out a food source, other birds in their group usually follow within a few days. The grackles were very scarce in the yard this day. They checked the feeders a few times but left without eating. So far, I still haven’t seen any American Goldfinches try it. Will Squirrels eat Nutra-Saff? Yep. The squirrels in my yard have been enthusiastically eating regular safflower for years. They are apparently just as happy with the Nutra-Saff version, eating what they found under these feeders. If your squirrels don’t eat safflower then my guess is that they probably won’t eat this either. (But give them enough time and a hungry squirrel will learn to eat either one.) If your squirrels already eat regular safflower, they’ll probably eat this too. Sometimes when you read articles about switching birds to a new food, they recommend mixing the new in with the old so that birds can gradually get used to it. I don’t think that is bad advice. It would keep birds from coming to the feeder and finding a weird-to-them food and immediately leaving. The idea is that you keep them at the feeder and maybe they will accidentally or purposefully try the new food and become a convert. For my test, I chose not to do it that way. I had grackles on the Squirrel Buster Plus feeder that I wanted to get off and I wanted to see their reaction to the new food. I didn’t want them to stay on the feeder and pick out the sunflower hearts and toss the Nutra-Saff. It is harder to figure out what they are eating and not eating if the seed is mixed. On the hanging platform feeder, I wanted to see if I could create a space where the cardinals could eat without competition. If I mixed the seed, then again, I’d have birds picking out the seeds they wanted. So to figure things out, I needed to make the switch cold turkey if you will pardon the almost pun. If you are instead wanting to switch birds in your yard over to something new a little more gently, you might want to try mixing the seeds and gradually increasing the new until there is no more of the old. Things are about the same on the third day. The Squirrel Buster Plus in the front yard continues to get very little activity (grackles or anyone) but the hanging feeder in the back yard is getting the same birds eating, although mostly cardinals, but the cardinals are spending long periods eating it. Right now my plan is to let the remaining Nutra-Saff in the Squirrel Buster Plus run out in a day or two and then, unless there is a huge surge in Nutra-Saff popularity on that feeder, I’ll go back to filling it with either sunflower hearts or regular safflower. (Hopefully long enough will have passed by then that the grackles will have moved on.) I have about a third of the original five pound bag of Nutra-Saff left, so I’m going to use it to keep the hanging platform feeder filled and see how things develop. I may eventually try it in the metal mesh tube feeder in the front yard which is also a feeder the cardinals like, but I’ll wait and see how things go on the platform feeder first. Update: After another week, I’d say the verdict is still mixed. I let the remaining Nutra-Saff in the Squirrel Buster Plus feeder very gradually run out and then, as there was no huge surge in Nutra-Saff popularity on that feeder, I’ll went back to filling it with regular safflower. The Nutra-Saff did serve its purpose on that feeder though, as the grackles have moved on. I used the rest of the original five pound bag of Nutra-Saff to keep the hanging platform feeder filled and bought another bag to keep it going. The cardinals seem to like Nutra-Saff and seem glad to eat it in this feeder, but none of the other species are showing any lasting interest in it. They seem to prefer regular safflower or sunflower hearts over it so far, so the cardinals have had this feeder to themselves for the past week. But at this point that’s okay. 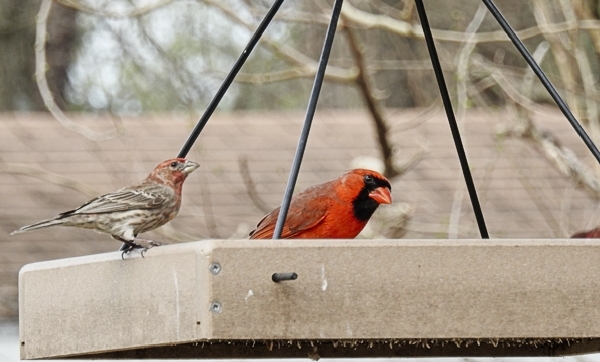 Finally the cardinals have a feeder that they are not being edged out of by more dominant birds . . . although it has warmed up here to the point that the yard has gotten pretty quiet; I waited too late in the season to really give this a good test against the nuisance flocks. I may eventually try Nutra-Saff in the metal mesh tube feeder in the front yard which is also a feeder the cardinals like, but I’ll wait and see how things go on the platform feeder first. This is an experiment in progress. I’ll update this post if things change, so check back again if you are interested.